Natural patterns inspire the work of Elizabeth Knowles and William Thielen. Separately they have created individual bodies of work over the last 25 years. During this time they were engaging in a dynamic, verbal dialogue on aesthetics and philosophy. Resulting from this long-term discourse is the recent collaboration the site-specific outdoor installation ModernDance. ModernDance celebrates and responds to the natural environment of landscape. Consisting of a series of colorful arches of differing sizes created from wire fencing and surveyor’s tape, ModernDance collaborates with the environmental setting in shape and size, ascending and descending in an undulating rhythm mirroring the organic tempo of the landscape. Because the installation is site specific, it changes size and shape each time it is installed. 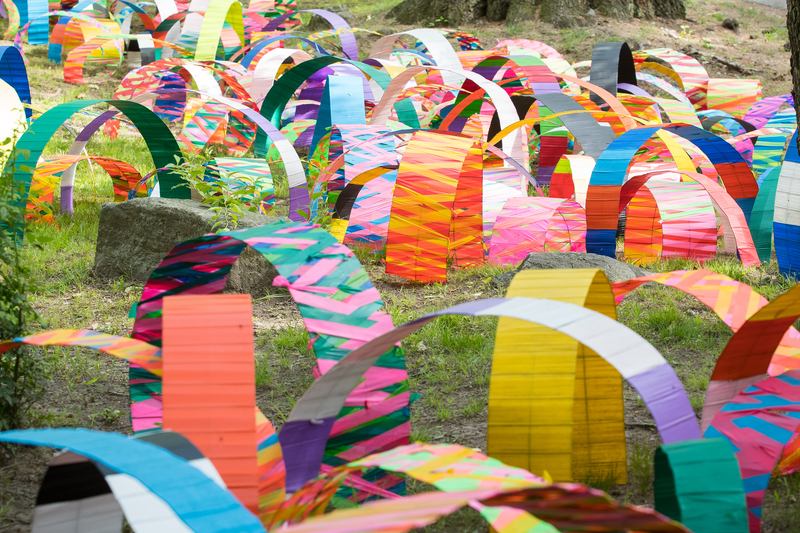 Adhering to the particular site, the installation responds in form to the configuration of the landscape with arches grouping in and out of the trees and plant growth, resulting in an endless possibility of color, form and fusion. William Thielen grew up in Pierre, South Dakota. He received his BS from Northern State College in Aberdeen, SD and his MFA from Southern Illinois University at Carbondale, IL. He has exhibited widely and in 2002 won a purchase award at Mitchell Museum, Mt. Vernon, IL. His work has been featured in numerous magazines. Lastly in Create! Magazine (May, 2017). He is currently a full-time studio artist in Carbondale, IL. Knowles and Thielen have most recently created outdoor site-specific collaborative projects for Governors Island, NY, Studio 80+Sculpture Grounds in Old Lyme, CT, and the Kingston Courthouse, Kingston, NY. Other collaborative installations include for Art In Nature curated by Karen Wilken at the Greenwood Gardens in Short Hills, NJ in 2014 and Contemporary Sculpture at Chesterwood, curated by Glenn Harper, Chesterwood National Trust for Historic Preservation, Stockbridge, MA, 2013. The 2015 July/August issue of Sculpture magazine includes a review and photograph of Knowles and Thielen’s installation Modern Dance.